Create a new lawn or fill in a bare patch Rake Remove all weeds and stones. Turn the soil over to a depth of 15-22cm (6-9in). Level and firm by either treading or using a roller. Shake Shake box to re-mix seed. You'll need a large handful per square metre (30g or 1oz/sq.yd). For a visual guide, apply to a measured area first. Create a criss-cross pattern by sowing half the seed from left to right and the rest from top to bottom. Gently rake in, then tread or roll seed into the soil. Water Unless it rains, soak with a fine spray and keep soil moist for the next few weeks. The grass can be trimmed when 5-8cm (2-3in). Each time you mow, lower blade height a level until it's at 2.5cm (1in). Do not cut more than 1/3 off the growth at any one time. When do I use it? Apply to your lawn during March to early October. How much will I need? This pack will create a new lawn of 20 m2 (5 m x 4 m). To determine the size of your lawn multiply the length by the width in metres. This will give you the size of the area you wish to sow. As a guide one large stride is approximately 1 metre. When will I see the results? In ideal conditions when the soil is moist, grass will start to germinate from 4 days. Over-seed an existing lawn Prepare the lawn by mowing it short, ranking out dead grass, moss and debris. 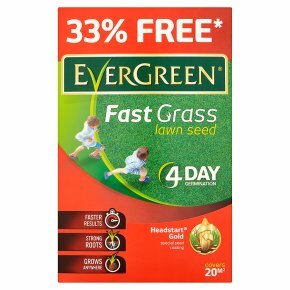 Apply a lawn dressing such as EverGreen® Lawn Soil. In dry conditions, moisten the lawn. Sprinkle a small handful of seed for each square metre (20g). Lightly rake the seed into the lawn. Unless it rains, soak with a fine spray and keep soil moist for the next few weeks.